Happy Bloggers Challenge Friday! If you haven't already guessed, this weeks challenge is a color challenge. Use the following colors: Chocolate, Crushed Curry, Mambo Melon (or similar colors) and neutrals as needed to create your project. My card is pretty simple - gotta love those 10 minute or less creations! 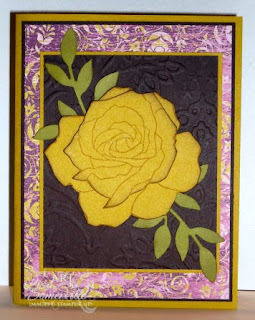 I stamped the Fifth Avenue Floral in Curry on Curry card stock, then cut out and layered with dimensionals to give it that popped up (Paper Tole) look. I layered some Olive Stems (Sizzlits Little Leaves) under the Rose, and placed it on a Chocolate Panel, that I embossed using the Texturz Plates. The Melon on my card can be found in the beautiful Razzleberry Lemonade DSP I used as my background panel. Thanks for stopping by - for more inspiration using this weeks color challenge, click on the Bloggers Challenge Logo on my sidebar. This is gorgeous Lisa! I love this image! I just love that flower! GREAT card! Very pretty Lisa. The rose looks gorgeous and pairing it with the Razzleberry Lemonade paper was a wonderful idea. So pretty, Lisa. I love yellow roses! Lisa, I love the card. That 5th avenue rose is darling. I am enjoying your challenges each week. Here is my rendition of the challenge. Love that background paper, you did a great job with this color challenge! Great card, love your layout. The flower is such a focal point. So pretty! The Crushed Curry is the perfect color for a rose. Very pretty! Love the Crushed Curry rose! Lovely and wonderful layer upon layer! Absolutely beautiful!